The murder of a man in rural County Antrim and a potential "policing brain drain" are front page news in Wednesday's Northern Ireland papers. The murder victim was found shot dead at his home in Glenwherry on Tuesday afternoon. The Irish News names him as 51-year-old David Murphy and refers to him as a "top loyalist". 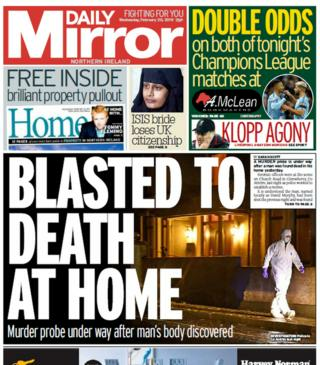 "Blasted to death at home" is the headline for the same story on the front of the Daily Mirror. It shows the same picture as the Irish News of a forensics investigator at the house where the victim was found. The Glenwherry murder is also featured on the front of the Belfast Telegraph. But that paper's lead story concerns Sinn Féin leader Mary Lou McDonald's comments about the successor to retiring Police Service of Northern Ireland (PSNI) Chief Constable George Hamilton. On Monday, Ms McDonald indicated an outsider should replace Mr Hamilton. Former assistant chief constable Alan McQuillan tells the Belfast Telegraph that her comments could lead to a "policing brain drain" in Northern Ireland. "Very capable PSNI officers may well now think they won't get a fair shot at senior positions and walk off to jobs in England," says Mr McQuillan. The newspaper's political editor Suzanne Breen says that Ms McDonald's comments "have deeply damaged her party's relationship with senior police and with unionists". "Yet they won't cost Sinn Fein a single vote," she adds. 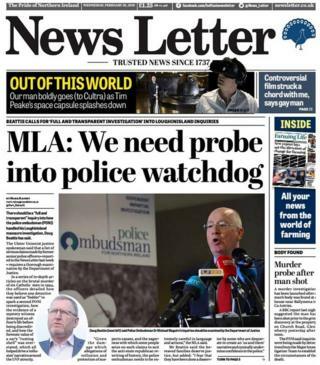 Other policing issues feature on the front of the News Letter. Ulster Unionist MLA Doug Beattie says there should be a full and transparent inquiry into how the Police Ombudsman handled his Loughinisland murders investigation. Six Catholic men were shot dead as they watched a World Cup match in the County Down village in 1994. Mr Beattie says a list of serious claims made by former senior police officers requires a thorough examination by the Department of Justice. The ex-officers claim the evidence of a mystery witness destroyed an officer's life before being discredited and that the forensic value of a car's "rusting hulk" was overstated, "helping to drive a collusion narrative" around the UVF atrocity. He says the bereaved families deserve justice, but added: "I fear that they have been done a disservice by some who are desperate to create an 'us and them' narrative and cynically undermine confidence in the police." In its inside pages the Daily Mirror focuses on other collusion claims. Sean Murray, the maker of a documentary on the so-called Glenanne Gang, says that former member John Weir - who was also a ex-police officer - told him he believes elements of British intelligence were behind plans for an attack on a Catholic school as retaliation for the IRA Kingsmills massacre. The UVF leadership is said to have refused to carry out the attack. The story is also carried in the Belfast Telegraph and News Letter. The Irish News carries an apology from the Catholic primate of all Ireland to victims of clerical abuse. Archbishop Eamon Martin made the comments ahead of travelling to a child safeguarding summit at the Vatican. He said he had met victims in recent weeks and "heard about how you were hurt and violated and about how your young lives were turned into a nightmare". "I am truly sorry for what was done to you." In the Belfast Telegraph, a footballer who was kicked in the head by a member of the team he was playing against hits out at the one-year ban handed out to his attacker. Gary Hill, from Portadown, had his cheekbone fractured in the attack by Niall Lavery in March 2017. Lavery then punched the referee. He was last week jailed for 15 months. Mr Hill welcomed the sentence but said the fact that the Irish Football Association had only banned Lavery for a year was "very lenient and the judge agreed". Finally the News Letter says that Northern Ireland millennials spend nearly £2,900 a year on average on takeaways, eating out, daily treats such as coffee, socialising and clothes. They also spend £626 on clothes and £393 on daily treats.